Soy is a legume and has been grown for three millennia in Asia and, more recently, has been successfully cultivated around the world. Today, the world’s top producers of soy are the United States, Brazil, Argentina, China and India. About 85 percent of the world’s soybeans are processed, or crushed, annually into soybean meal and oil. Of the oil portion, 95 percent is consumed as edible oil. The rest is used for industrial products such as fatty acids, soaps and biodiesel. Soy is one of the few plants that provide a complete protein, as it contains all eight amino acids essential for human health. In order to ensure the integrity of Zoye, Zeeland Food Services, Inc.® uses only identity preserved (IP) soybeans. This means that details about the identity and origin of the crop is tracked from the farm all the way to the finished product. IP soybeans command a premium in the marketplace because of the additional work involved. 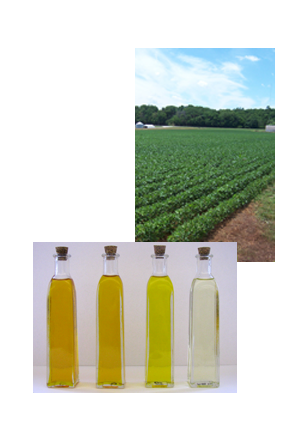 Soybean oil is among the healthiest of all edible oils and has a very favorable fatty acid profile. Zoye is low in saturated fat, high in polyunsaturated fat and contains monounsaturated fat. Soybean oil is one of the few non-fish sources of omega-3 polyunsaturated fatty acids, which have many benefits. Our “Soil to Oil” process ensures complete control over our soybeans – from planting the seed in the soil to processing the oil. That’s one of the reasons we put such importance on identity-preserved Zoye Low-Sat, Low-Linolenic, Everyday Salad & Cooking, and Everyday Frying & Cooking oils. Identity-preserved crops are grown and handled under controlled conditions for specialty use. 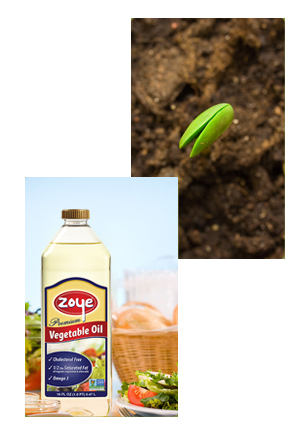 This means Zoye is pure and will always meet the highest quality standards, and we know with absolute certainty what’s in the bottles: all-natural, 100% pure soybean oil. We even go above and beyond with our oil – every Zoye shipment on every truck is tested to ensure maximum quality. ZFSelect low-saturated and low-linolenic seeds are planted. The seeds grow in the fields of our contracted growers where they are carefully monitored via GPS process. The soybeans are harvested under identity preserved methods. 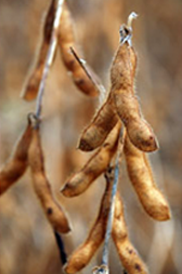 Using renewable energy, the soybeans are processed into food-grade oil by extracting the oil from the soybeans.